Libby is all Jack, fiesty, hyper and very smart. She loves long walks, and meeting new people (so she can lick them). No one who meets Libby believes that she is also a lap dog, once she settle downs she's a snuggler. 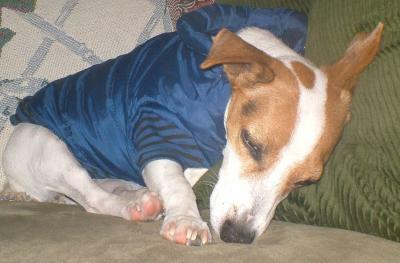 looks like she had tough day of "russelling"
Libby looks just like my jack russell. My topper (that is the name of my dog) has the same diamond on his head as your dog dose. I thouught that I had posted his picture here! so identical. I am bias about Libby. She's my "niece" after all, but she is the cutest Jack I know. SO MINE HE COVER HIMSELF WITH THE BLANKET AND LET US SEEKING!!! !